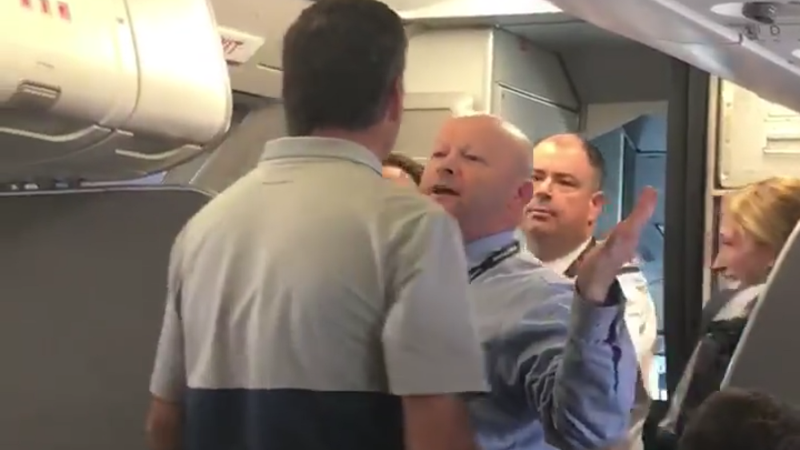 American Airlines Is Investigating the Flight Attendant Who Jeered At a Passenger to "Bring It On"
American Airlines has grounded a flight attendant who got into an aggressive verbal confrontation with a passenger after allegedly taking away another passenger’s baby stroller. The video begins after the alleged hitting occurred, but it does show an unidentified woman holding a baby and sobbing at the front of the plane, a pilot standing impassively nearby. “You can’t use violence with a baby,” she says. “Just give me back my stroller, please.” A pair of female flight attendants attempt to calm her. Eventually, the “guy,” an American Airlines flight attendant, enters the frame, prompting Fierro to once again spring from his seat. “Hey bud, you do that to me and I’ll knock you flat,” Fierro says, approaching the flight attendant. The attendant shouts at Fierro to “stay out of this,” and the two get in each other’s faces. “Hit me,” the attendant says repeatedly. “Come on, bring it on.” Several members of the flight staff struggle to separate them, including the pilot. The attendant eventually allows himself to be taken back to the front of the plane, and Fierro returns to his seat, apparently at the behest of a woman traveling with him. “Tony, sit down,” she’s heard saying. “We want to go home.” The pilot walks in and out through the cockpit door, which appears to be hanging open throughout the duration of the episode, so...good thing no one decided to go in there! The incident comes on the heels of another in-flight confrontation, this one perpetrated by United Airlines, in which a passenger was violently dragged from the plane after refusing to give it up.